Perfect way to see battery status and remaining charge percentage on your main screen and lock screen! 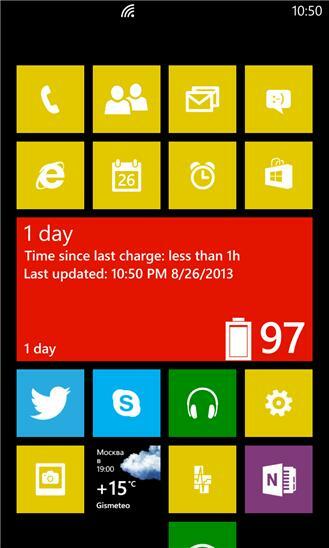 Features: - three types of live tiles; - detailed battery status on lock screen; - rich battery usage and rate charts (landscape mode supported); - detailed battery usage statistics; - time since last charge; - remaining time to full charge; - different types of notifications (when the battery is fully charged, when the battery is discharging quickly, when the battery is low); - customizable theme color; - save chart as picture, send history to e-mail, save history to SkyDrive, backup data to SkyDrive, restore data from SkyDrive; - shortcuts to Wi-Fi, Bluetooth, Location, Cellular, Airplane mode settings. 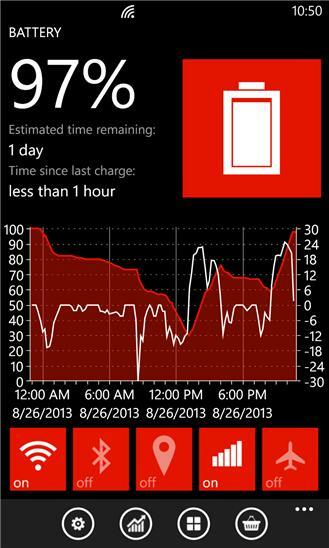 Note: - tile refreshes every 30 minutes (this is Windows Phone limitation); - full battery level (100%) is shown as 99 (this is also Windows Phone limitation).